Brian Metter raises to 80,000 in the hijack and Dave Gunas shoves all in for 1,135,000 in the cutoff. It folds back to Metter who quickly calls and tables A♠A♥. Gunas shows 8♦8♣. The flop comes J♣J♠2♣ leaving Metter's aces in the lead, but the 4♣ river gives Gunas flush outs. The 9♣ river brings the flush, and Gunas doubles up. "Aces are the nut low," Gunas says as the pot is passed over to him. John Marshall is all in for around 1,100,000, and has been called by Gennadiy Kostrov who holds a very similar stack size. The board runs out A♥8♠2♥5♠Q♠. Kostrov is awarded the pot and after a very close count of chips, it's determined that Marshall is eliminated from play in 13th place, for $5,202. There is some confusion on Table 3 and a crowd is gathering around the table. Apparently both Will Failla and his opponent Ahmet Bolat misread the board, resulting in a double for Failla when all was said and done. Apparently, when the flop came K♦8♦4♥, Bolat bet 250,000 in the small blind, and Will Failla shoved all in for around 380,000. Bolat called and the players tabled their hands. The turn came the 10♠. When the river came the 6♥ Failla stood up from his chair preparing to leave but another player not involved in the hand told both players to recheck the board and both were surprised. Bolat didn't know that he had a pair, and thought he had flopped only a flush draw. Failla said he thought the flop had two hearts as well and didn't realize his kings were good. "Can someone please check the cameras?" Bolat asked half jokingly, "I really thought I hit the flush on the river." 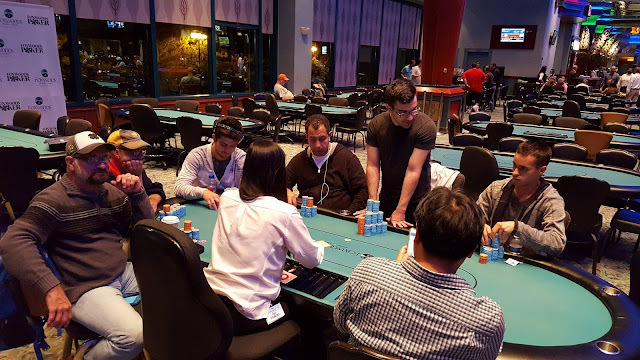 Edwardo Berte Da Rocha raises to 46,000 in the hijack, and Kevin Kernan shoves all in on the button for around ten big blinds. Da Rocha calls and the players table their hands. The board runs out Jack high, Berte Da Rocha's tens hold, and Kernan is eliminated from play in 24th place, paying $3,435. 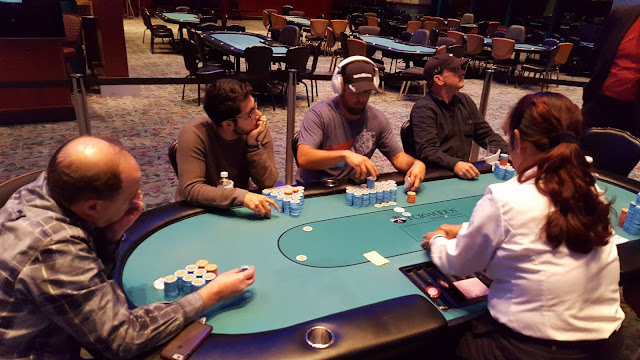 Aaron Shepard shoves all in from middle position and Dave Gunas calls. The board runs out 7♦3♥2♠6♠5♣, eliminating Shepard in 26th place. There were a total of 229 entries in today's Event #4, generating a prizepool of $57,754. There's nearly 500,000 in the middle and a board reading 8♥7♣4♦4♥2♦. Will Failla bets 250,000 in the small blind, and Brian Metter goes into the tank in the cutoff. After nearly two full minutes Metter moves a stack of chips forward to call. "Do you have ace king?" Failla asks as he turns over A♠Q♣. Metter turns over A♣K♥ and Failla says, "I thought you were good enough to fold." As the chips are passed over to Metter Failla says, "I knew his hand. I just couldn't get him off it." Facing a raise from Dan Chalifour in the cutoff, Joseph Gerron shoves all in from the small blind, having Chalifour covered. The big blind folds, and Chalifour calls for less. The flop comes J♦6♦5♦, giving Chalifour the diamond flush draw, but keeping Gerron's aces in the lead. The 10♠ turn and 5♥ river do not improve Chalifour's hand and he is eliminated in from play in 31st place. It was limped seven ways to the 10♣9♦5♠ flop. It checks to the player in the cutoff who shoves all in for 260,000. 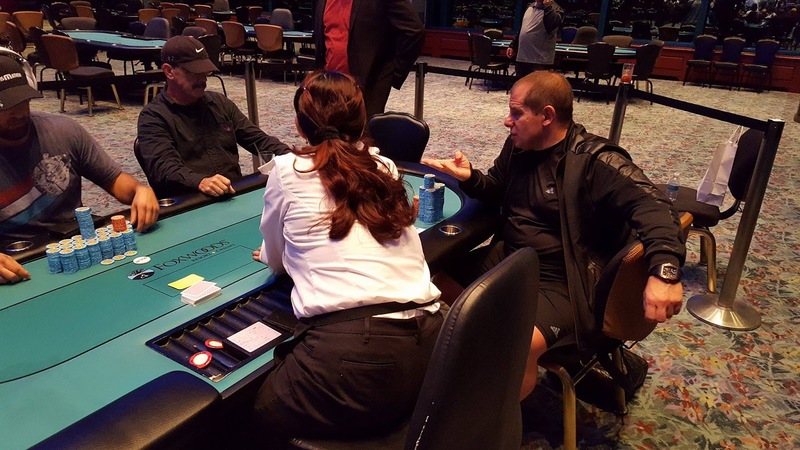 Joe Heinzmann calls in the small blind, and Ken Harding calls for his remaining 205,000 in the big blind. All other players fold, and the three players table their hands. 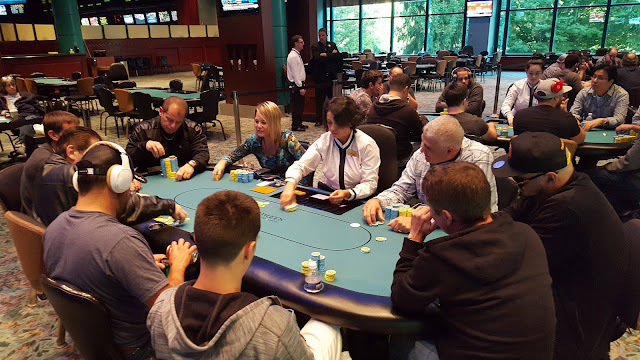 The 2♦ turn and Q♣ river do not change the hand, and Heinzmann is awarded the pot, while his two opponents are eliminated from play. We are down the final 38 players, and they are just returning from their 15 minute break. Here are a few chip stacks from players still in the field, including chip leader Edwardo Berte Da Rocha, who is currently the player closest to the 2 million chip mark. According to Laurie Hilton, her and She Lok Wong had some history after a few hands played against eachother on last night's bubble. Hilton said that last night she told Wong, "If I am seated next to you tomorrow, I am going to take all of your chips." Just a few minutes ago Wong was moved to Hilton's direct left. After he sat down Hilton said to him, "By the end of this level, I'm going to have all of your chips." The very next hand, Wong open shoved around 300,000 holding 6♦6♠, and Hilton snap-called holding A♦Q♠. The flop was safe for Wong, but Hilton turned an ace, and Wong failed to improve on the river, and he was sent home in 41st place, paying $2,061. "How fortuitous is that?" Hilton says as she stacks her chips. Hopefully within the next few days you will see upgrades to the stream including the tournament clock information as well as names of players (only for final tables). So please stay tuned as we implement the improvements. Players are now on their first 15 minute break of the day. During this break the Floor staff will be coloring up the pink 500 chips and removing them from play. There are 70 players remaining and they will return to play Level 20 (4,000/8,000 blinds with a 1,000 ante). Here is a look at a few notable chip stacks from the field, including number of big blinds they will have upon return from the break. There's nearly 60,000 in the pot, and a board reading 6♠3♥3♣Q♦. James Watt checks in the hijack and Steven Brackesy bets 30,000 in the cutoff. Watt calls. The river is the 5♣. This time Watt bets out 40,000. Brackesy pauses, looks at the board, slightly scrunches up his face, and then after 30 seconds moves forward two stacks of chips to call. Watt turns over A♣Q♠ and Brackesy mucks his cards face down without showing. Chris Spence shoves all in from middle position for around 60,000. Action folds to Joe Reddick in the small blind who announces that he is all in for more, and the big blind folds. The board runs out 10♦5♠2♠K♠9♦ awarding Reddick the pot, and Eliminating Spence from play in 87th Place for $1,276. The flop comes K♥9♦7♦ increasing Segouir's lead to a set of kings. The 6♣ turn and 2♠ river do not change the hand, and Segouir doubles up early in Level 1. The returning 115 players have taken their seats and Day 2 play is now underway. All players are officially in the money and guaranteed at least $1,227, with first place paying $84,820. For full prizepool information please see this link. There were a total of 957 entries over the course of the three starting flights of Event #1, with 115 of them advancing to Day 2 (and one player that bagged twice). The prizepool totals $491,993, and the returning 115 players are all officially in the money and guaranteed at least $1,227. *One player bagged in both Flights A and B. So only 27 total players are actually advancing from Flight B. Here is a look at the 56 players advancing to Day 2 in the money from Flight C of the $600 No-Limit Hold'em Re-Entry event. These 56 will join with the 32 from Flight A and 28 from Flight B. Day 2 will begin at 12:00 noon tomorrow Tuesday Oct. 4th. Giuseppe Ruvolo is the only player to have bagged in multiple flights. He bagged 62,000 in Flight A, and bagged 178,500 in Flight B. 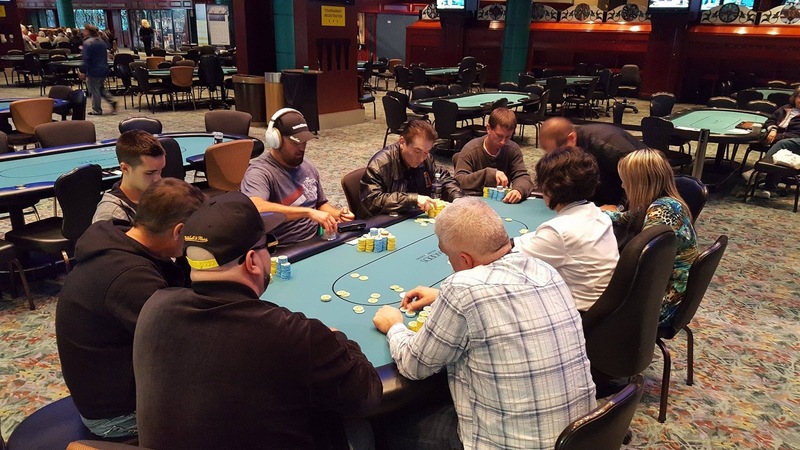 He will be compensated $1,200 for his second bag, and will move only his largest stack forward to Day 2. Below is the list of all players bagging in today's Flight C.